I would love to recommend most highly our wonderful homebirth midwife Susanna Napierala. Susanna has been an integral part of the births of both of our beautiful children. We have learned so much from her vast amount of experience as a pioneer bringing waterbirths to the U.S. Our first child was supposed to be a homebirth, but our boy came just a bit too early. Susanna had prepared us well beforehand, getting to know us and allowing us to get to know her. She provided perspective, and options enabling us to ultimately make the difficult decision to go to the hospital with her support and accompaniment. At the hospital, she helped us implement our birth plan without medical interventions by giving us advice from informed observations throughout the evolving labor. She supported us and was sensitive for our need to advocate for ourselves in the hospital/corporate environment. For our daughter’s birth, we had the wonderful experience of a home waterbirth. It was during this birth that we were able to see Susanna truly in her element. She was clear about the roles for each participant, and displayed great leadership making sure we had the proper team assembled (i.e. 2nd midwife, and doula), and that we understood our supportive roles for the wishes and needs of mama and baby. The labor and birth itself was short and beautiful, dictated by mama and baby. Susanna was strong, calm, and supportive. She allowed the process to unfold at its natural pace, saying just the right thing, in just the right way to each of us. She recognized the signs of the process and advised accordingly and decisively. She is a consummate professional who leaves nothing to chance yet does not impose unnecessary treatments or interventions. She empowers parents and especially birth mothers to own the process and give birth without fear. I hope more families call on Susanna. She is a treasure in this world of ever increasing medicalization and corporatization of the birth process. ​She demonstrates to us how to be in touch with and trust our bodies. Just want to put out there a recommendation for our wonderful homebirth midwife Susanna Napierala. Susanna was amazing for us on many levels. 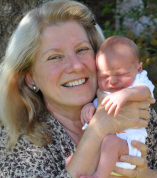 She has over 3 decades of experience helping moms deliver babies at home. She has been instrumental in helping to bring water births to the U.S., having studied directly under Igor Tjarkovsky, and writing the book – Waterbirth, A Midwife’s Perspective. She has extensive knowledge of many possible birthing circumstances that can onlycome from participation in so many births over the years. She prepared us very well with knowledge, tools, techniques and emotional support…she was totally there for us as our homebirth morphed into a hospital birth due to our baby coming 4 weeks early. She was a constant calming influence, offered us scenarios to consider at each stage and supported our choices. Her hands-on techniques and intuition were a great comfort to us before, during and after labor and delivery. She took the time to get to know us on a personal level, creating a bond that was critical during the trying times of labor. She is most concerned with positive outcomes (healthy baby, healthy mama) and while giving us the best opportunity to carry out our homebirth plan, she was not afraid to recommend the safest course of action when circumstances did not seem quite right. I recommend her most highly and without reservation to any potential homebirth parents on the North SF Bay Area. ​I was 41 weeks pregnant and was feeling very eager and impatient for the labor process to begin. On Thursday, July 6, I lost my mucus plug. Several hours later, the early hours of Friday morning, I was awakened with some contractions that persisted until 10a... I decided to go into work because I had felt contractions at this intensity before, and they had turned out to be Braxton Hicks. I left work around noon because I wasn’t feeling myself and my supervisor was concerned about the potential of me going into labor. Once I got home, I took a nap and woke around 2 pm. By 3, my contractions started again. I wanted to stay moving, but it was 101 degrees outside, far too hot for a walk, so I decided to go to the mall to walk around. As I walked, contractions got more intense, so after an hour I decided it was a good idea to go home and ask my husband to leave work. I cooked a nice dinner so I would have strength if this turned out to be labor. We called Susanna to notify her and she instructed us to call when my contractions were more consistent. After dinner, I decided to try to relax and to get some sleep. My husband started a movie and we cuddled up in bed. About half way through the movie, my contractions started to get painful and I was unable to sleep. In fact, staying still, sitting, or lying down made the pain so much worse. The only way I could get relief was from walking, bouncing on an exercise ball, or getting on all fours. Knowing I was in labor and this was going to be a long night, I continued to try to get some sleep between contractions; however, sitting or lying made the pain excruciating; making sleep impossible. It was also very difficult for us to gauge how far into labor I was because the time between my contractions was very inconsistent. I would have one contraction 3 minutes apart, another 10 minutes apart, another 5 minutes apart, etc. The intensity was also quite variable. I was worried that I was still in early labor so I didn’t want to have Susanna come too soon and have nothing to do. My spirits were waning , so around midnight, my husband called my mom to come and help out. After midnight, time was such a blur. I was so withdrawn, only able to focus on managing the pain that time seemed to disappear completely. I was in such a fog that even my memory of my birth process feels a bit blurry and I am uncertain of the order of the events. After my mom arrived, she helped for a while and then got concerned that I was getting far into my labor and needed Susanna to be present. Because the time between my contractions continued to be so sporadic and all over the place, I was hesitant to request Susanna’s presence since I believed I was still in early labor. After my mom and husband insisted, I asked Susanna to come over. Once Susanna arrived, she checked my cervix and reported that I was 8.5 cm dilated. It seemed that things were really moving fast. She called the other midwife to assist and my husband got in gear to fill the birth pool. After it was full, I got in and the water was absolutely amazing! It seemed to cut the pain of my contractions in half. I was so relaxed spending time in the water. My labor started slowing down and I developed a cervical lip, necessitating my departure from the pool to labor with the assistance of gravity. I was disappointed to leave the pool, as I had hoped to have a water birth. I labored while lunging, on a birth stool, while walking, on the toilet, and on the bed. Susanna then encouraged me to labor in the shower with my husband. The sensation of the water pressure and the confined space really bothered me. I exited the shower. Susanna then suggested I go to the bed where I labored in different positions to try to get rid of the lip. Eventually the lip resolved and I was 10 Cm dilated. By that point, it felt like I was laboring forever! I was in so much pain and was so exhausted, that I doubted my ability to continue and feared pushing because I was terrified that it was going to hurt so much worse. Emotionally, I fell apart completely and was cursing my decision to have a baby without pain management drugs. I think I might have even asked to be taken to the hospital. Susanna talked to me just in the way I needed to get me through that inner struggle. She used a firm but kind tone with me. She shared her birth story with me, which helped me to stop judging myself for my feelings and soothed my emotional struggle dealing with the pain. She walked me through guided imagery. Both of these interventions helped me calm down and placed me in a mindset that gave me energy to complete my birth. I never felt a strong urge to push, like was described by our labor coach or my friends. So Susanna suggested that I just give it a try. She had me pushing from different angles. I pushed for about two hours and then tried pushing on the birth stool so gravity would help the baby exit. My husband held me from behind while Susanna sat in position to catch the baby. I pushed several times and the baby seemed to fly out of me with incredible force. Susanna caught her. Our baby Reese was born at 11:25 a.m. on 7/8. She was crying the first 5-10 minutes of life. Susanna immediately handed her to me. I was concerned that I would drop her as she was wet and Susanna assured me that I was not going to drop my baby and wrapped her in a blanket and handed her back to me. After I delivered the placenta and my husband cut the umbilical cord, we laid in bed. I got to cuddle with Reese and fed her for the first time. Susanna explained how to breastfeed. Everyone left the room and my husband, baby, and I had our first moments alone together as a family… our bonding time. Susanna stayed with me hours after the birth. This was invaluable to me, because I was exhausted after giving birth. I really needed someone who would take on a leadership role, help guide me, and be a voice of reason and encouragement. Susanna fulfilled all of these roles for me. She intuitively knew what I needed without me having to ask, which is a good thing. During this process, I really struggled to effectively articulate my needs. 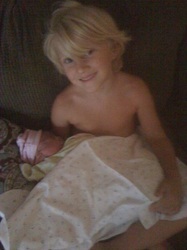 Giving birth was by far the most challenging but rewarding experience of my life. 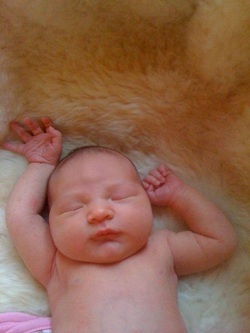 I feel very fortunate that my birth experience was, in large part, uncomplicated and I was able to have my home birth. Susanna was such an amazing guide, mentor, and friend throughout this life changing process. I wouldn’t have wanted my birth experience any other way. I can't express in words how thankful I am that I was able to have such a wonderful midwife take care of me through my pregnancy, birth and post care. Susanna is exceptional at making one feel well taken care of. She is attentive, accessible and hard working. She has the experience and knowledge that great midwifes have along with a beautiful personality of care, love and commitment to her work. She has gone above and beyond what I could have ever asked for from anyone in the medical field, and I will always be grateful to her for giving us such a perfect birth experience. 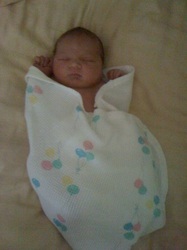 Baby Sulema born March 1st! The evening before my due date I started feeling a little strange, like there might be something going on with me hormonally. I felt like I had chills as if I was getting sick, but I didn't feel like I was getting sick. Francisco said my face looked flushed. We went to bed that evening hoping we would get to meet our little one soon. I woke up around 2:30 a.m. feeling crampy. I immediately thought this might be early labor and lay in bed trying to sleep but I couldn't sleep because the contractions, while mild, were coming every five minutes. I talked to my midwife, Susanna, on the phone a few times to update her on my progress. She asked questions about the contractions, encouraged me to try to sleep and told me if this is labor it’s very early. I called Susanna again about an hour later to let her know how things were progressing. She again told me it’s still early on, but asked if I was comfortable with her not being there. At that point, I was. At a little after 6:00 a.m. I asked Francisco to call Susanna to ask her to come over. I was starting to worry if we waited much longer she would get stuck in rush hour traffic and I didn’t want to risk having the baby while Susanna was stuck in traffic! At about 7:30 a.m. Susanna arrived. I was in the bedroom. She immediately asked Francisco to start boiling a big pot of water to sterilize her tools. She came into the bedroom and said she wanted to check me to see how far along I was. I was dilated 1 centimeter, 85% effaced and baby was at -1 station. During this check Susanna stretched my cervix open to 3 centimeters. It was painful but really got labor going quickly. Soon after Susanna arrived I labored for a little while in the living room/kitchen area to be near Francisco and Susanna. Susanna wanted me to eat. Earlier that morning I had a smoothie because I knew I was supposed to eat and that was really the only thing I could stomach. Susanna suggested I eat eggs, which sounded disgusting, so I went to the kitchen to try to find something somewhat appetizing. While I was standing in the kitchen I felt a very strong contraction come on. I dropped to hands and knees, then told Susanna I felt sick. She immediately got me a bowl and I vomited up all of the smoothie. Yuck! I left the kitchen and didn’t consider eating anything else. After leaving the kitchen I went back to bed. Around 9:00 a.m. Susanna told me we were going to go for a walk in the neighborhood. That sounded awful; I could not imagine a worse way to have a contraction than to be outside walking. I procrastinated and tried to get out of going on the labor walk. Susanna checked me before the walk; I was 4.5 centimeters dilated, 90% effaced and the baby was still at -1 station. It was nice to know I had made progress and was about halfway there, but I was not dilated enough to get out of going for the walk. We left for the walk at about 9:20 a.m. Susanna told me when contractions came during the walk Francisco and I were supposed to both drop into a squat with me leaning on him. As we were getting ready for the walk I had a contraction at the front door. Susanna dropped into a squat with me and demonstrated how we should do it. We left for the walk, an dit was the most beautiful spring day I have ever seen. The sun was shining, birds were chirping, the sky was clear and blue, the trees were in bloom, and the temperature was perfect. Everything was extremely vivid. It felt like a day made for a birth! Contractions were coming one on top of the next; it felt like I couldn't walk five feet without stopping and squatting through another contraction. I would walk a few feet then turn to Francisco and say, "Okay, let's do another." We would both squat down, and he was the perfect support; I leaned completely into him and found myself moaning through very intense contractions. Neighbors were stopping as they drove by to make sure we were okay. Susanna intercepted everyone and said, "everything's fine, we're just having a baby." I remember hearing one man say something along the lines of, "it sounds like she's ready." (I didn't care in the least at the time, but it's a pretty funny scene to look back on!) Susanna must have agreed because she cut the walk short and we turned around and went home. We got home at about 10:00 a.m. and I went straight to the toilet, where Susanna told me to continue laboring. In retrospect, I know now I was in transition while I was on the toilet. At the time I felt like the contractions were really intense and I didn't feel I was managing them well. I felt my hips were tight and I told Susanna, "I can't relax on the toilet." I wanted to go back to bed, but she suggested I get in the tub. I immediately said yes, thinking the water might give me some relief. I did get about a minute or two of relief as soon as I got in the water. Susanna checked me right away and told me, "you're 9 centimeters if not complete." She immediately yelled to Francisco, who was now back in the kitchen. I remember Susanna yelling, "Francisco!" He didn't respond, and I yelled, "We're going to have a baby!" It was about 10:20 a.m. at this time. I started pushing around 10:40 a.m. I was getting light-headed and started breathing oxygen after each push. Susanna was checking the baby’s heartbeat regularly and determined the baby wasn’t happy when I lay on my back. She suggested I lay on my left side. I couldn’t get comfortable in that position in the bathtub I started out lying down and wasn't making much progress so I switched to a squat position in the tub. Francisco was in charge of turning on the oxygen and giving me the mask after every single push. We had a good rhythm going - I would push, take a couple of breaths of oxygen, push again, breath oxygen, etc., until the contraction ended. I have always heard people say it feels good to push, and I definitely experienced that. It was hard work to push but I did not feel pain when I was pushing. At some point Susanna told me to feel the head. I reached down and felt a soft hairy head, but really had no emotion or interest and just wanted to get back to work. In what seemed like no time, Luna (Susanna's assistant midwife) arrived just as I was delivering Sulema's head. Then I heard Susanna say very calmly, "the cord is around the baby's neck twice." As soon as I heard that I pushed hard and the rest of Sulema's body came out. It was 11:32 a.m. I didn't see Susanna unwrap the cord, but I think she got it unwrapped even before the body came out. I was standing in the tub and Susanna handed me the baby who was already making noises and turning pink. I was in complete shock. Every time I watch a birth video I get teary when the baby is born, but I had none of those emotions when Sulema was born. I was simply in shock. I remember saying something like, "I can't believe it," over and over again and just staring at the tiny person in my arms. Almost immediately after I stood up with Sulema in my arms I felt something warm. I looked down and saw a stream of pee going from the baby into the tub. Before I had time to look at where the pee was coming from I heard Francisco say, "It's a girl!" Susanna and Luna helped me out of the tub and into the bed while I held Sulema, who was still connected to me. We lay in bed together while Susanna and Luna checked out my tear and waited for me to deliver the placenta. Susanna said the tear was most likely caused by Sulema’s shoulders – I’m sure it happened when I did that last big push because I really pushed hard and fast. Eventually they gave me a shot of Pitocin in the leg to get the placenta out so they could start stitching me up. The placenta came out easily and I felt the same weird empty feeling in my abdomen that I felt when Sulema was born. They kept the placenta in a bowl and proceeded to repair my tear. The stitches took awhile, but weren’t painful and healed well. Later that day Susanna showed us the placenta and explained how it works – that was very cool to see. She stayed and helped clean up and made sure we were all doing well. Susanna left that evening then returned the next day, a few days later, then a week later and a month later. It was wonderful to have that in-home support while I was healing and adjusting to having a newborn.